Build 3021 is available now and focuses on improving workflows in a a variety of ways. I mentioned in the last post being interested in what would help your workflow and general usability, and in this release attempted to fix a few common pain points. The full changelist is available on the Update Center (and at the bottom of this post). Let’s take a short tour through a few of the improvements. This one is simple but long awaited. JPEG is now supported as a format for input and output. Even though JPEG is a lossy format, it is nonetheless a fairly common one for texture assets, reference maps, etc so it’s very useful to be able to read or write it. OpenEXR is a different beast altogether. Besides being a long-overdue format, there are a ton of useful features that WM does not yet use, including the ability to potentially put many channels/layers into a single file. If there’s demand, the ability to do this could be added. Filenames can now use template substitutions within Outputs. The filename for each device is being dynamically created from the device name and the world resolution. Any part of the template path that doesn’t exist will be created. 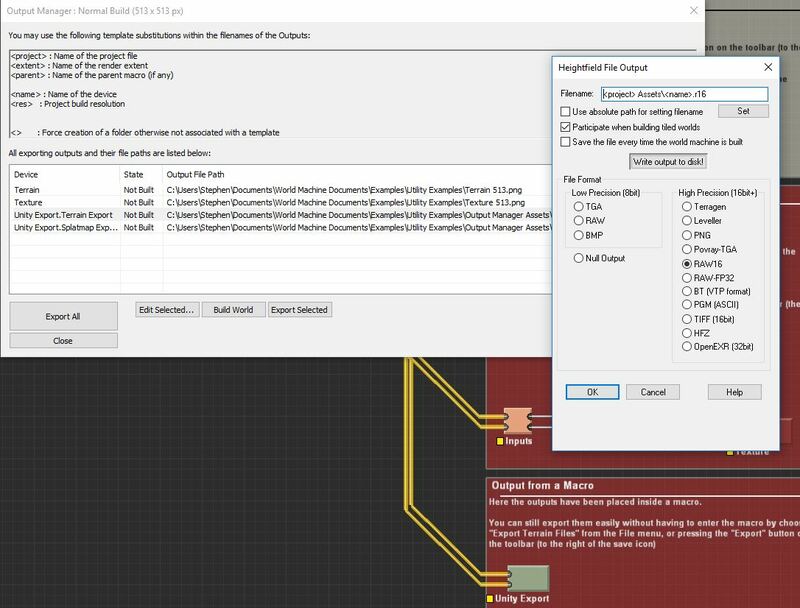 In this example, a “<project> Assets” folder is created to place the “<name>.r16” file within. Outputs within Macros work. You can see the “Unity Export” macro contains two outputs that are exposed to the Output Manager. A significant amount of work went into making navigation more consistent and easier in all of the various windows in WM. For the most part, you can continue using World Machine views the same way as you have before — the additional navigation methods are supplementary. Orbit and Free-look modes now work together as you’d expect. Previously you more or less had to use one or the other as they interpreted the camera differently. The Middle Mouse button now tracks (pans) the terrain. When viewing from the side, this allows you to raise or lower the Z value of the orbit point, something that wasn’t possible before and was sorely needed. The Right Mouse button zooms as before. However, if you zoom into the orbit point, it pushes the orbit point forward, allowing you to naturally explore the terrain this way. Ctrl and Shift are now global modifiers that speed up / slow down the rate of each action. I think you’ll find its easier than ever to just navigate and not have the camera controls get in the way. Layout View navigation has been changed to make it consistent with the 3D view. There is a long-term plan to merge these two views together and let all layout actions happen in the 3D View, so this is an important first step to make that comfortable. 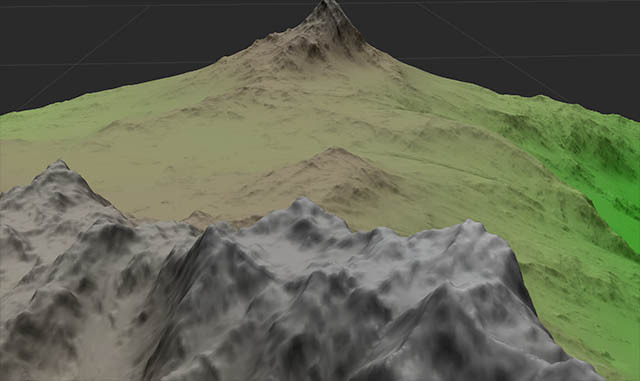 Left and right click-dragging still pans the terrain. The Middle mouse button now also pans the terrain. You got it — the Device workview now also follows the same convention as above (except with no rotation possible). A few other details were ironed out, including the different roles for CTRL and SHIFT and adding a preference option for preferring to pan or box-select on left-drag — see the changelist for details. The Slope Selector has always been a little weird. Many a person has been confused by what exactly the units represent. That’s because, in a decision dating back to the very beginning of World Machine, they were “normalized slope units” — basically a number that represented a slope between 0 and the maximum that could be expressed based on the project settings. However, that’s useful to approximately no one. 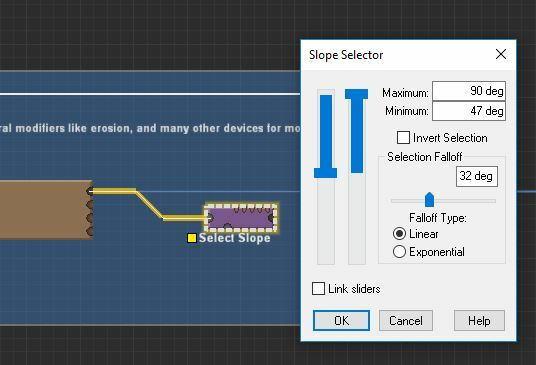 So the Slope Selector has been changed to work directly in degrees. You can now also directly enter the numeric values into the boxes. Huzzah! You may also find that the resulting mask is subtly different from before — this mostly doesn’t matter, but this change is versioned because of this. There’s lots of little things I really enjoy personally, such as being able to Copy-Paste (ctrl-shift-V) settings into already existing devices, along with a subtle indicator to let you know if the operation succeeded or failed. 32bit output for heightfields, 16bit for RGBA bitmaps. * Slope Selector now operates in degrees and allows you to directly input numeric values. Versioned change, right click and choose “Device Version…” to update old selectors. * Output Manager revamped and dramatically improved. – You can use template names such as <name> or <res> to name your files. For example, “<name><res>.png” is a valid template name. – Create folders as part of the output name. For example, “<project> Assets\<name> <res>.exr” is a valid name and will create a “ProjectName Assets” folder that it outputs the file to. You can now use ctrl-shift-V to paste settings into a device. Useful when you need to clone settings into a device already hooked into the network. – Maya-style (LMB=Orbit, MMB=Track, RMB=Zoom) supported. – 3D View, Layout View, and even the Device Workview now all support the same consistent navigation system. – Previous navigation methods continue to be supported. * Tiled builds do additional validation of sufficient disk space, writeable folders, etc before building, and reporting also improved. * Macros now build their internals properly even when those devices are not connected to an output. I’ve previously installed dev channel builds without issue. I also tested that I was able to download and run the WMDEV3020_Professional.exe installer just fine. I tried rebooting, re-downloading, and trying again, but experienced the same problem. I’m running Windows 10 64-bit home edition. You shouldn’t get a security warning about unknown publisher — the installer is signed with the key “World Machine Software LLC”. I just did some investigating, and it appears there may have been a download corruption issue. Try the download again! The PDK zip for 3021 seems corrupt. Can you check please? Should be updated and working correctly! Can I get an access to build 3021 please? I missed the chance to register apparently.